TKO kunckle orthosis on pinkie and ring fingers. 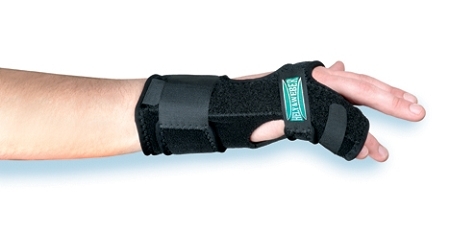 The TKO, short for "The Knuckle Orthosis" is a brace to provide stability, splinting, and positioning of the metacarpals, phalanges, MCP, and IP joints following injuries or fractures. 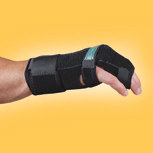 The TKO is universally sized with adjustable straps for fit and comfort, as pain and swelling changes. 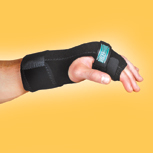 The TKO includes a distal buddy strap to stop the rotation of the fingers, and the padded stays are malleable to the users hand. The TKO is also reversible to act a as a Boxer's fracture splint (ulnar gutter), radial gutter spling, or a middle/ring finger splint. 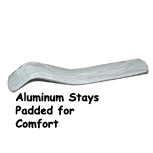 The TKO universal fits hands up to 10.5" inches around at the palmar crease. The TKO also comes in a XL for hands with larger than 10.5" in circumference.